Turkey has begun extending aid across its border with Syria to help people who have massed there fleeing unrest, the emergency situations agency said Sunday. “Distribution of humanitarian aid has begun to meet the urgent food needs of Syrian citizens waiting on the Syrian side of our border,” the statement, posted on the agency’s website, said. It was the first time that the Turkish authorities had launched a cross-border aid mission after having sheltered more than 10,000 Syrian refugees in tent cities on Turkish territory. Thousands of Syrians have massed on their side of the border, still undecided to cross. They have braved a rough life in the open air or in makeshift shelters of branches and plastic sheets, surviving on scarce food and water from wells. 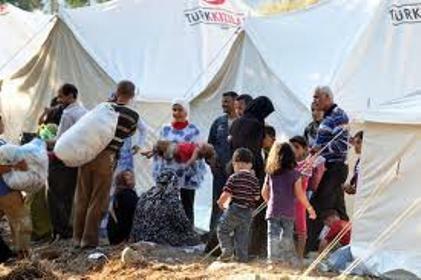 The statement said the number of Syrians taking refuge in Red Crescent camps in the Turkish border province of Hatay stood at 10,553 on Sunday after another 585 people arrived and 146 went back to Syria of their own free will. On Thursday, Foreign Minister Ahmet Davutoglu said Turkey would keep its borders open to Syrians fleeing the violence and supply humanitarian aid to the thousands on the other side of the line. Many come from Jisr al-Shughur, a flashpoint of the anti-government uprising 40 kilometres (25 miles) from the Turkish border that was pounded by Syrian regime troops.